Washington DC--President Trump gave a press conference this morning and said he was going to put false rumors to rest once and for all. He said all the nonsense about Russian ties was fake news, and that organizations like CNN, the New York Times, and the Washington post were, "a bunch of losers." 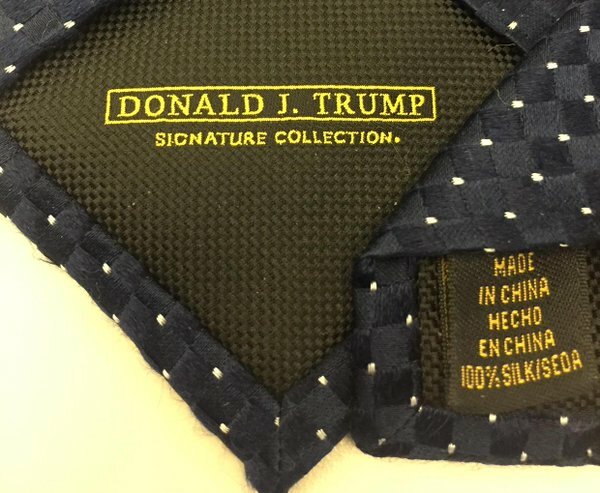 Trump had a wide array of ties from his Signature Collection, and all were made in China. In fact, just to show that he doesn't hate Mexicans who aren't rapists, murderers, drug dealers or Democrats, President Trump pointed out that the "Made in China" label was also written in Spanish. President Trump then produced a taco bowl that the White House chef had prepared, While contending it was not as good as the ones at Trump Tower, he ate it rapidly and with enthusiasm. He did, however, spill a good deal of taco sauce on the tie. President Trump then ordered a well-done steak with ketchup for dessert, and once again managed to spill it. The President then removed the tie, left the room, and Kelly Anne Conway entered. Several reporters noted the tie was dirty, but Conway dismissed those comments as fake news. She claimed the ties were perfectly fine, and that this was an alternative fact. Conway then took out a six pack of Trump-branded magic erasers and purposefully removed the stains. This reporter examined the tie, and had to admit it looked as good as new. Conway then attacked Macy's and Nordstrom's for dropping Trump-branded products, and said we should all go out and buy lots of Trump-branded stuff. Conway said it was widely available online, and personally guaranteed that these products would make men irresistibly attractive to their adult daughters. To their credit, only two of the gathered reporters actually vomited.